Snip the rind of each pork chop at 1.5cm intervals. Crush the fennel, coriander seeds, peppercorns and salt until well bruised, but not ground to a powder. Rub into the pork. Melt 15g butter with the oil over a medium heat. The frying pan should be large enough to hold the pork and rhubarb fairly snugly. Put the pork in the pan, rind side down. Cook for 2-3 minutes until nicely browned. Cook the chops for 2 minutes on each side. Add the remaining butter and orange zest to the pan. Baste the chops, turning once. Pour the wine into the pan and bubble for a few seconds, then add the orange juice and bring to a simmer. 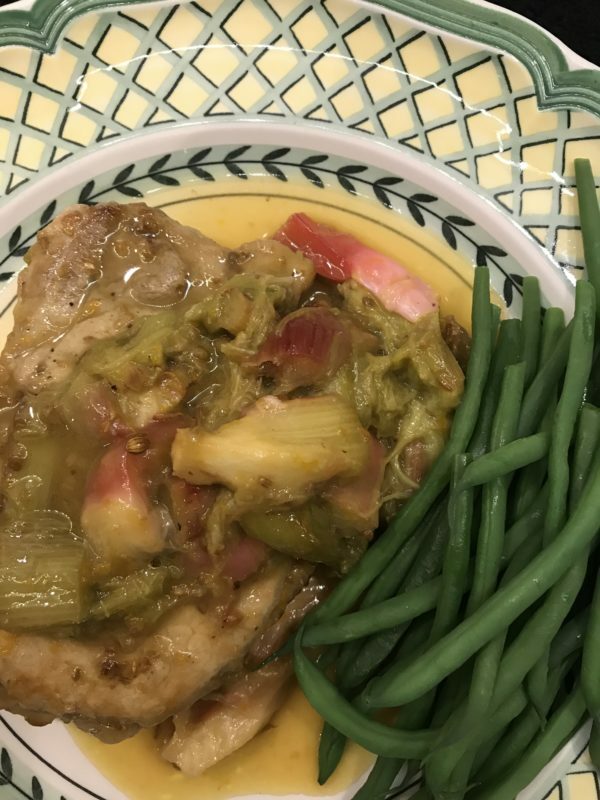 Dot the rhubarb around the chops, drizzle with honey and cook for 4-5 minutes or until the pork is just cooked and the rhubarb is softened but holding its shape. Turn the pork once and don't stir but gently swirl the sauce as it cooks. Take the chops and rhubarb out of the pan with a slotted spatula and put on to two warmed plates. Increase the heat under the pan and simmer the sauce until thickened and slightly syrupy. Pour over the pork and serve. British pork chops and pink rhubarb make a glorious and surprisingly quick spring supper. The buttery sauce is flavoured with fennel and coriander seeds, orange zest and a good slug of wine. Serve with creamy celeriac mash.